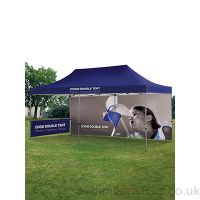 An event tent for fairs and fetes, in durable 420 denier polyester to shade you from the sun or inclement weather. Suited to smaller company and product promotional needs, they can also be printed or branded with your required graphics. Uv and water resistant fabric on a 40mm hexagonal aluminium framework that folds down. These event tents can with stand winds to Beaufort scale 4 when pegged down without side walls fitted. Expect a week supply time for printed event tents. Every promotional tent is supplied with a wheeled bag. Call 01256 768178 to discuss your outdoor event needs. Event Tent Walls - half wall. Event Tent Wall - full height.